For the second consecutive year, the Jaguars selected Duval Dynasty, the Boys & Girls Club of Northeast Florida’s NFL FLAG all-star team, to represent Jacksonville at the NFL FLAG Championships in Orlando. The championship tournament was held in late January in conjunction with the NFL’s Pro Bowl Week at the ESPN Wide World of Sports Complex. Coaches Rickie Simon Jr. and Troy Soloman led the group of 13- to 14-year-olds to compete on the national stage in one of the highest levels of flag football. In addition to Duval Dynasty, more than 70 youth teams from 24 states across four divisions competed in the annual culmination for the country’s premier youth flag football program. CB Jalen Ramsey continued a Jaguars tradition when he and the Nike Jordan brand partnered to give each competitor a brand-new pair of Jordan football cleats to wear during the competition. Last season, RB Leonard Fournette surprised each member of the Duval Dynasty with a pair of Under Armour cleats prior to the championship. 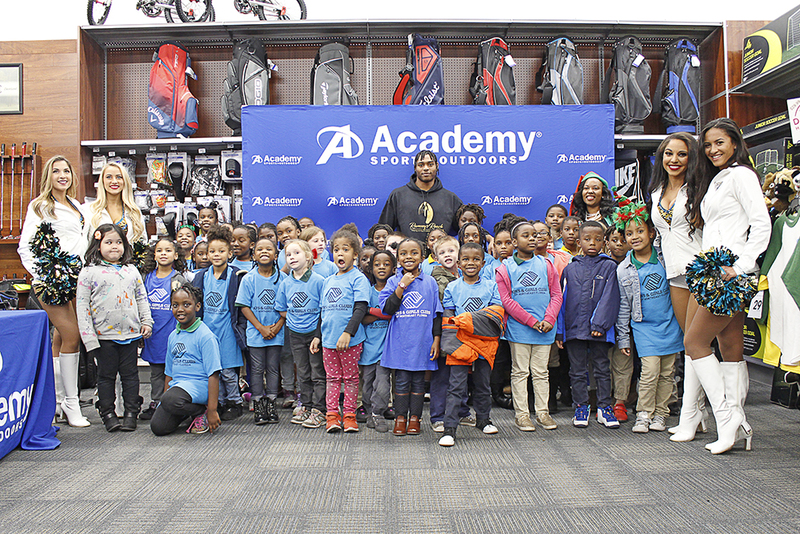 Boys & Girls Club of Northeast Florida noted that the partnership with the Jaguars and their implementation of NFL FLAG into their program has resulted in a tremendous jump in Clubs’ retention rate by keeping teens engaged through the power of sports. Boys & Girls Clubs of Northeast Florida Club members talk about their favorite features of the new Citi Teen Center. JACKSONVILLE, FL / January 07, 2019 - Boys & Girls Clubs of Northeast Florida is reopening its historic founding Club, the Laurence F. Lee Boys & Girls Club, as the Citi Teen Center. The Laurence F. Lee Boys & Girls Club was founded in April 1966 by Laurence F. Lee Jr., the son of Boys’ Club of Jacksonville founding board member, Laurence F. Lee. The Citi Teen Center will be Boys & Girls Clubs of Northeast Florida’s first standalone teen center and will offer teens from across Jacksonville access to a mixed reality enabled computer lab, technology programing, barber shop, beauty salon, dance studio, gym, movie theater, print shop and bicycle shop. 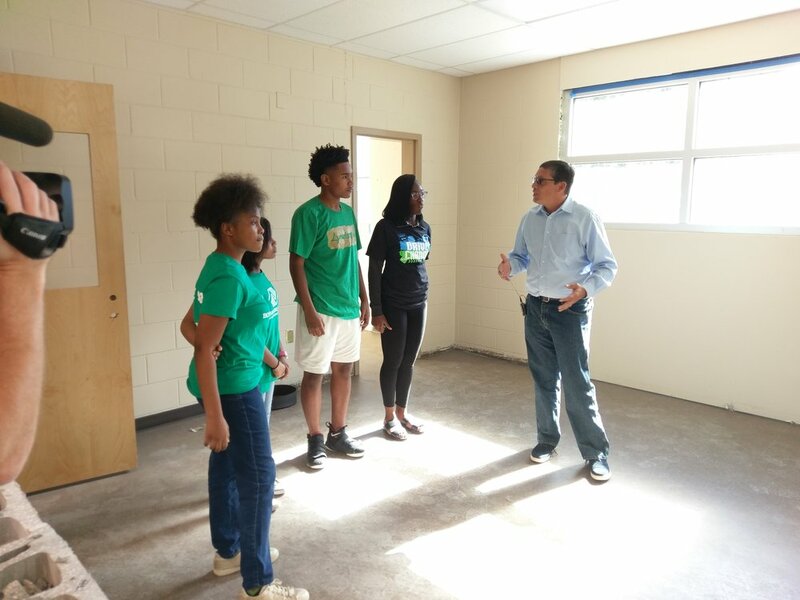 Boys & Girls Clubs of Northeast Florida President and CEO, Paul Martinez, gives Boys & Girls Club members a tour of the Citi Teen Center currently under construction. JACKSONVILLE, Fla. - Jaguars' A.J. Bouye, joined by some of his teammates, took 50 children from the Boys and Girls Club of Northeast Florida on a holiday shopping spree Monday night. The All-Pro and Pro Bowl cornerback hosted the Shop with a Jock event at the Walmart on Philips Highway in Jacksonville. "I'm looking forward to it, especially since last year was a success," Bouye told News4Jax. "This is something that's very fun for me. You know, I have a daughter myself and just to have these kids around -- just make this night about them." The Jim Moran Institute for Global Entrepreneurship in the Florida State University College of Business, which acts as a resource to small businesses, has formed a Jacksonville Fellows Program. Chad Corbitt, Bob Moore, Paul Martinez and Sarah Slettebo were named as inaugural fellows. They will assist small business owners and nonprofit leaders. On the 50th anniversary of Dr. Martin Luther King’s death Wednesday, city leaders, community organizers, school children and residents celebrated the completion of a decade-long project designed to bring meaning to the Dr. Robert F. Hayling Freedom Park. The green space set on a bluff overlooking the San Sebastian and Matanzas rivers was dedicated last year in honor of one of St. Augustine’s own leaders in the civil rights movement. Hayling, through his activism, was instrumental in bringing King to the city in 1964 — a visit many consider pivotal in pushing forward legislation that led to desegregation. The Boys & Girls Clubs of Northeast Florida want to breathe some life into the old languishing Laurence F. Lee club building in Springfield. The facility at the corner of Liberty and 10th served the community for 50 years. But it has been vacant since the summer of 2015 after the recession and rising maintenance costs took their toll on the building, according to the Springfield Preservation and Revitalization Committee. Teachers, students and community volunteers are taking time out of their spring break to build a playground for a local school in Arlington. More than 100 volunteers got to work Friday at Arlington Community Academy setting up picnic tables, benches and an outdoor classroom. Students and parents were involved with picking the equipment for the playground that will be shared with the Boys and Girls Club of Northeast Florida. Project SOS, now a Boys & Girls Clubs of Northeast Florida program, surpassed its $200,000 fundraising goal at the New Orleans-themed Grand Anchor Gala held at the Ponte Vedra Inn & Club on Saturday, Feb. 24. The annual fundraiser celebrated 25 years of serving First Coast teens and raised money for Project SOS programs and new Boys & Girls Clubs of Northeast Florida facilities designed to assist the community. The two organizations merged in the summer of 2017. Additionally, THE PLAYERS' Executive Director Jared Rice announced the donation of three new vans to the Boys and Girls Clubs of Northeast Florida. Students and their teachers then posed for a photo in front of the TPC Sawgrass clubhouse building to conclude the event. Pam Mullarkey Robbins, Ben Wuerffel, Nicole Ferreira with Jack, Paul Price and Kimberly Deas gather at the 2017 Grand Anchor Gala. The annual Grand Anchor Gala benefitting Project SOS is set for Saturday, Feb. 24 from 6 to 10 p.m. at the Ponte Vedra Inn & Club, where event attendees will celebrate 25 years of the nonprofit organization’s efforts in serving First Coast teens. Robbins founded Project SOS 25 years ago when she felt compelled to help teenagers with goal setting, decision making, boundaries, bullying, avoiding drugs/alcohol and more. Since its inception, the organization has impacted the lives of 475,000 local teenagers across Northeast Florida through its in-school programming that focuses on healthy and unhealthy relationship skills, substance abuse, refusal skills for sexual risk avoidance, depression and suicide, social media and more. Pam Mullarkey Robbins, founder and CEO of Project SOS, and Kevin Carrico, Vice President of Operations for Boys & Girls Clubs of Northeast Florida, announce the upcoming Project SOS Grand Anchor Gala on Feb. 24. Proceeds from the event help fund the ongoing efforts of this combined organization as Boys & Girls Clubs utilizes Project SOS programming to influence and impact local teens. Boys & Girls Clubs of Northeast Florida is also building new teen centers in Springfield and Arlington, expected to open fall of 2018 and fall of 2019 respectively. Terry Frank, Director of Marketing and Strategic Projects for BBX Capital; Angie Kenyon, Vice President of Real Estate Retail Brands for BBX Capital; Brick Kerge, Vice President of Operations for MOD Pizza Florida; Paul Martinez, President/CEO of the Boys and Girls Club of Northeast Florida; Jason Gilmartin, General Manager MOD Pizza Jacksonville; Kirk Wendland, Jacksonville Director of Economic Development and Lois Marino, Director of Community Engagement for MOD Pizza Florida. MOD Pizza celebrated its first location in Jacksonville with a grand opening event Dec. 19. 100 percent of all pizza sales on opening day were donated to the Boys & Girls Club of Northeast Florida. The first 52 attendees were treated to one free artisan-style pizza. MOD serves individual, artisan-style pizzas that are made on-demand in minutes using fresh-pressed dough and signature sauces. Customers can create their own pizzas and salads, using any combination of over 30 featured toppings, or they can choose from a menu of MOD classics for a fixed price of $8.17. The restaurant is located at 12547 Bartram Park Blvd in Suite 201. November 2017 - In the spirit of the holiday season, Jalen Ramsey, of the Jacksonville Jaguars, provided Thanksgiving dinner for 20 families in need at the Boys & Girls Club of Northeast Florida located in Springfield. Each family received a box filled with ingredients to enjoy a traditional Thanksgiving meal. Jacksonville Jaguar Cornerback, Jalen Ramsey snaps a picture with a local Springfield family who he gave a Thanksgiving day meal. Boys & Girls Clubs of Northeast Florida is partnering with Jacksonville University on a new 20,000-square-foot, $2.5 million facility near the school’s campus. It’s a collaboration to help strengthen JU’s partnerships in the Arlington community. The university will lease the four-acre parcel across University Boulevard near Milne football field. The Boys & Girls Club is expected to use about three acres of the land and eventually be able to serve about 100 teens on the campus. Artist rendering of JU Boys & Girls Clubs Teen Center in Arlington.